ATP today announced its entry into the FBO business: ATP Jet Center, a full-service FBO at Daytona Beach International (DAB), is now open. 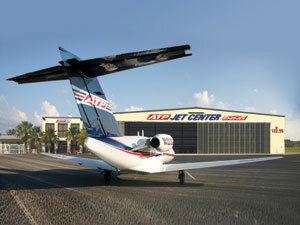 In addition to all the standard FBO amenities, ATP Jet Center provides an internet pricing guarantee at ATPJetCenter.com for full- and self-serve AVGAS and full-service JETA. As a member of the Shell Aviation network, ATP Jet Center accepts AvCard, Multi Service, and Shell fuel cards. Hangar space is available with fuel discounts. Located inside the new ATP Jet Center is ATP’s Flight Training Center, providing flight training from Private Pilot through Instrument Rating, Commercial and CFIs. Just five minutes from Embry-Riddle Aeronautical University, ATP provides a great value to students who want to combine the academics of Embry-Riddle with the professional multi-engine flight training of ATP. ATP plans future FBOs with leases in place at Arlington, Texas (GKY) near Dallas and Mesa, Arizona (IWA) near Phoenix. As ATP begins accepting delivery of its Diamond D-JETs, ATP expects to offer D-JET training at each of the new facilities.